with approximately 6,000,000 still without power 4-5 days (depending on location) after the storm and communities still cut-off from the outside world, I want to close out Meteorological Musing's coverage of Irene with a remarkable time-lapse of Irene with the National Weather Service's path forecast superimposed. While they were not perfect, I'm very proud of my colleagues at AccuWeather and the National Weather Service for superb forecasts of this dangerous storm that unquestionably saved lives and dollars. The meteorological profession came through again. I'd now like to talk just a moment about preparedness. The Wall Street Journal has an online story just posted about "slow pace" of the recovery. Political leaders encountered frustrated residents in the northeast Wednesday, angered by days without power, continued flooding and what they perceived to be a slow government response to Hurricane Irene's devastation. Standing with her school-age son and daughter beside her, Andrea Trout said she had Type 2 diabetes and was struggling to keep her insulin at the proper temperature because her refrigerator lost power. "I'm feeling afraid," she said. She has been in the dark since 7 a.m. Sunday. I absolutely, totally feel for these people. But, rather than complain to politicians (which is the topic of the story), I would like to suggest to readers that it is wise to prepare for future disasters and plan to be self-sufficient for at least a week whether it is an earthquake, hurricane, or ice storm. Here is a set of links for planning for a disaster. We had a wonderful celebration at WeatherData to conclude its 30-year run. As I mentioned on the blog last week, our name is is now AccuWeather Enterprise Solutions. There is no doubt in my mind that even bigger and better things are ahead of us. But, it was fun today to pause and think back over the last 30 years and all we have accomplished. Our colleagues at AccuWeather's home office in State College joined us via videoconference and everyone had a wonderful time. Thirty years ago today was the first day in business for a tiny company, WeatherData, Inc., that I founded August 31, 1981. The chances of a startup company making it to the 30-year mark are far less than 1%. So, I thought our readers might like to know some of the principles of our success. Never start a company until you have a well-defined goal about which you are both passionate and competent to execute. · 100% of the entrepreneurs I have known say creating and running a business is harder than they expected. I know I expected it to be hard but I, too, found it to be extraordinarily difficult, especially since mine was 24/7. There is no way I could have stuck it out unless I was passionate about my goal of saving lives and property. · Every entrepreneur to whom I have given this advice has later told me it was one of the most important pieces of advice they received. If you get overly depressed when bad news occurs, entrepreneurship probably isn’t for you. · Until you actually become a business owner, you cannot possibly appreciate how much responsibility you have and how heavily, at times, it will weigh on you. Formal business plan, no. Set of principles, yes! · Unless you have plans to go public or raise venture capital in the near future, the time required to write a detailed, formal business plan isn’t worth it. But, a set of rock-solid principles are vital. It is what your business stands for and what will set it apart. Get the best people you can, period. But, if your passion is starting a business, go for it! I’ve loved being an entrepreneur. I'll have more on WeatherData's 30th anniversary later today. 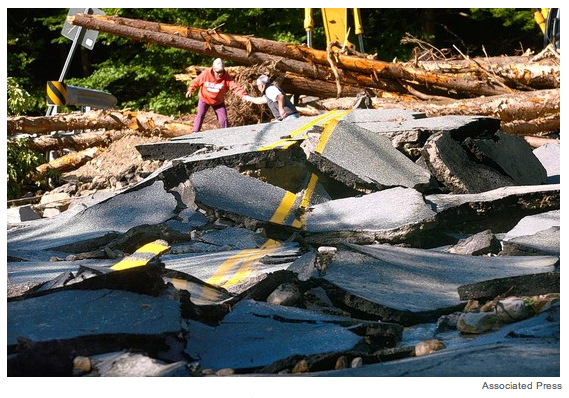 There are now two news stories (one yesterday, one today) complaining that Vermont was not warned of the danger of Irene. As I state below, my head was down in the data for days and so I cannot speak for anyone else. But, I can state that Vermont was included in the warnings Tweets that I was sending out. How explicit were the warnings? 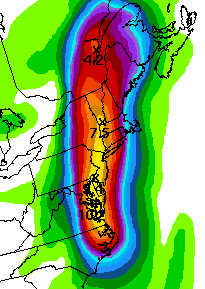 For four days, I -- and others -- were warning of the likelihood of flooding in New England. I posted this Saturday along with map outlining, in red, an area of "major flooding" that included Vermont. Calling, in advance, for evacuation preparations for a 200-year flood plain width around rivers is indicative of an extreme hazard. I know the NWS had a flash flood watch out for the area. When I wrote about all of the hazards meteorologists were trying to think through, this was one of the hazards I was talking about. So, as tragic and devastating as the record flooding has been, it is not accurate or fair to say there was "no warning." ...more than doubled tripled since this time last week. I would like to thank all of our Twitter followers, especially any we might have failed to individually thank in the craziness of the hurricane and earthquake. We enjoy hearing from you and retweets are always appreciated. If you'd like to follow, we're @usweatherexpert. One of my objections to the global warming movement is the hypocrisy of many of its principals. 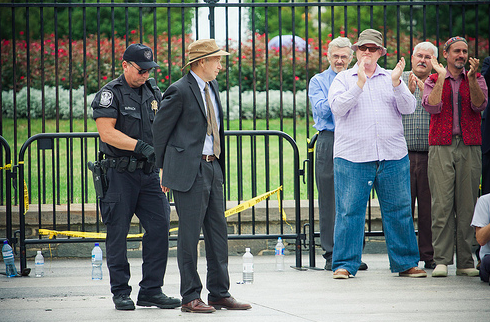 Here is a photo (hat tip: WattsUpWithThat) of global warming zealot Jim Hansen of NASA getting arrested (again) in front of the White House yesterday. 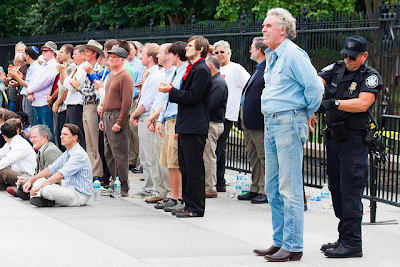 He is protesting a pipeline that will bring more Canadian oil into the U.S.
Notice anything odd in a photo of a protest about the environment? No? Let's try another showing an arrest of another person from another angle. Look at the plastic water bottles strewn about the area! This is the White House. Don't these environmental activists have enough pride to clean up after themselves?! How about environmentalists setting a good example? Al Gore, Rajendra Pachauri (head of the IPCC), and Laurie David ("environmental activist" and producer of An Inconvenient Truth) all frequently travel on business jets. Even the Duke and new Duchess of Windsor fly commercial! Gore has five mansions and a yacht. 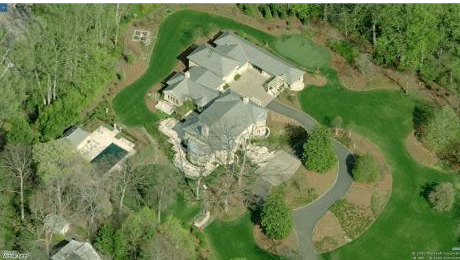 Thomas Friedman calls global warming a "catastrophe," yet has a 115,000 sq. ft. mansion in Maryland (below). As Glenn Reynolds puts it, I'll believe global warming is a crisis when the people telling me its a crisis start acting like its a crisis. While I disagree with much of what the global warming movement stands for, I consider myself an environmentalist. But this sort of behavior makes all environmentalists look bad. Please "clean up" your act! 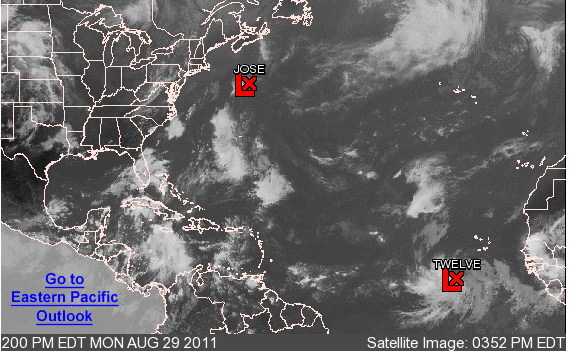 The name "Katrina" is retired so Tropical Storm Katia has formed in the Atlantic. She is expected to intensify into hurricane status the next few days. Important note: Don't sweat Katia. It is by no means certain she will hit any land mass and, if she does, it will not be this week. Fatalities? Tied with Fran for 10th with 21, but Irene's are expected to rise. UPDATE: According to the WSJ, 38 fatalities are now reported as of 10pm CDT Monday. As of 9am Tuesday, the death toll stands at 40. Irene is now #4 in terms of fatalities since 1980. Average the two and you get the 9th 6th worst hurricane in 31 years. Imagine, for instance, if Irene had been about 20 percent stronger when it hit New York — that it had wind speeds of about 90 miles an hour instead of 75 miles an hour. That doesn’t sound like a huge difference and from a meteorological perspective, and it isn’t. But from an economic perspective, that may have mattered quite a lot. Some of the scholarly literature suggests that the economic damage resulting from hurricanes is a function of wind speeds raised to the eighth power. I’ll spare you the math: what that means is that hurricane with wind speeds of 90 miles an hour might be as much a 4 or 5 times more destructive as one with wind speeds of 75 miles per hour. So if Irene had been just a bit stronger, we might be talking about economic losses on the order of $55 billion to $70 billion, rather than a “mere” $14 billion. 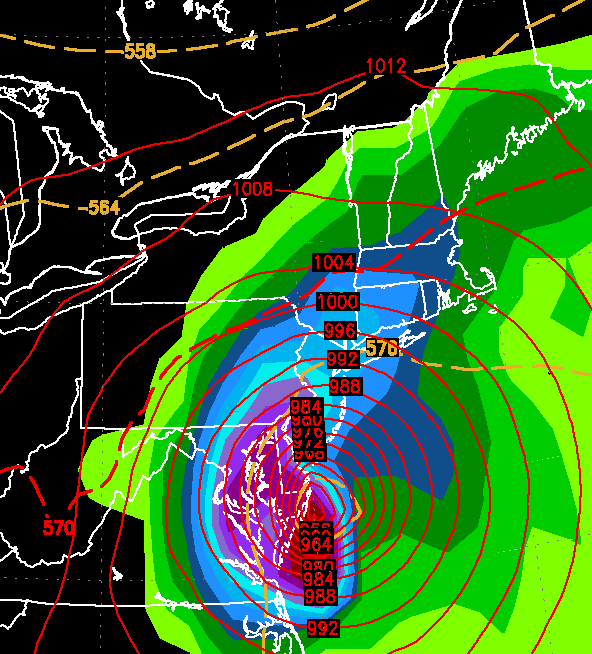 Because wind power (the wind's destructive force) is not linear, the forecasts showing winds of 95 to 110 mph near the storm's center (that we were forecasting would move inland farther west than shown in this computer model forecast) had the potential to cause major, major damage. 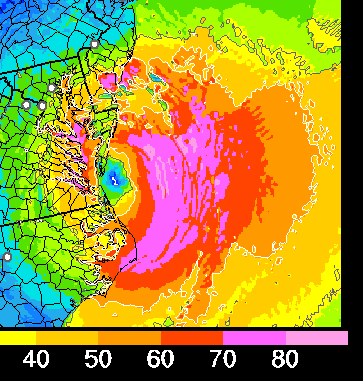 Given that Irene is already the 10th 4th worst in terms of fatalities at Cat. 1 intensity, those stronger winds would have threatened lives to a far greater extent. This was in the back of our minds as we were making those forecasts of Cat. 2 intensity on Thursday. 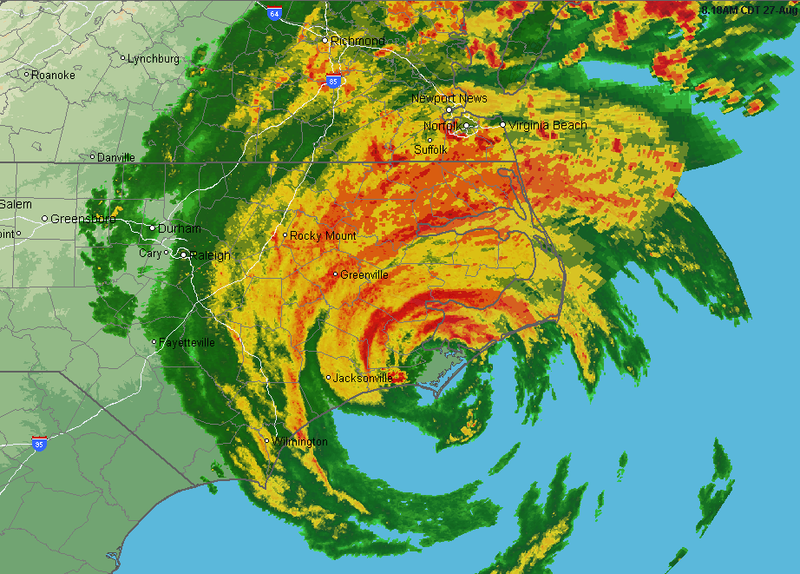 So, how did the meteorological profession do with Irene, a rare hurricane that made landfall in the Northeast United States? Meteorologists almost always do postmortems on major storms because we need to learn from our mistakes so we can do it better next time. By definition, it is difficult to forecast rare events because of the lack of analogues. For example, if there has never been a full-fledged hurricane in Manhattan in the era of skyscrapers, how will we know the level of damage a hurricane might cause? So, with that in mind, let’s go over some of the forecasts made on this blog and compare them to reality. My colleagues at AccuWeather and I made some excellent proprietary forecasts that were sometimes ahead of those available from government sources, which is what our business clients pay for. However, because I do not post those forecasts on this blog, I'm doing an analysis of the public forecasts I posted here. The first forecast in which I expressed confidence was titled, “This Looks Correct to Me: Irene’s Path.” I wrote, The eye (which is what is being forecast, not the geographic extent of the storm) could make landfall anywhere in the stippled area. The intensity was overforecast at this point. We were forecasting a category 3 and it was a cat 2 when it made landfall. Tuesday at 7:19am (roughly four days before landfall), the point of landfall in North Carolina, while slightly far west, was extraordinarily good for four days out. There was still an over forecast by one category but that isn't bad at all given it is four days out. Why did the forecast improve? Because the National Weather Service started launching weather balloons at six-hour intervals and NWS and USAF hurricane hunter and high-level aircraft began gathering special data to load into the computer forecast models. Shortly after 10pm, I forecast posted the first of a series of genuinely amazing path forecasts. Things didn't change much on Wednesday. I wouldn't change very much of what I posted on Tuesday and Wednesday. Thursday at noon I posted the two sets of forecasts I'm not proud of. Titled, This Looks Serious, and, Irene: My Concern is Rising, I walked readers through some of the newer computer models that were taking the intensity of Irene up to, perhaps, a category 4. If this had occurred, the results would have been devastating. 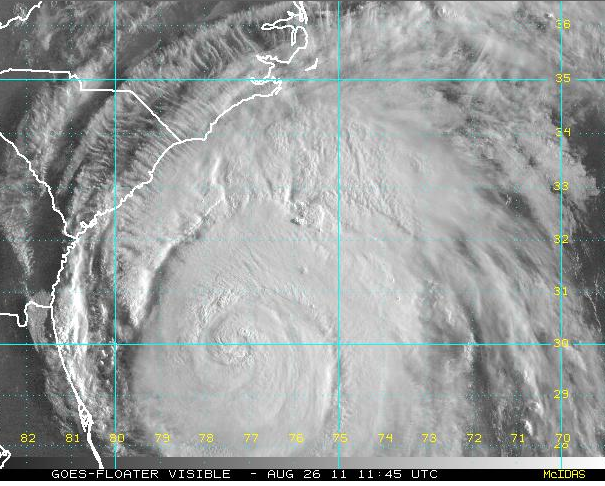 Irene did intensify aloft but for scientifically unknown reasons the intensification never made it to the ground. Meteorologists just do not have a solid understanding of the processes which cause tropical systems to intensify or weaken. Throughout the week, I warned of extensive power failures due to toppled trees from wind and wet ground. 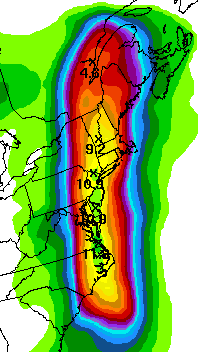 I posted the map below of forecast rainfall which I predicted would lead to "major flooding." Below is the rainfall map from Irene. Unfortunately, the colors are not the same but I believe you'll agree that 3-4 days out (depending on location), the correlation between the forecast and actual is remarkable. From this point on, the path, wind, and rainfall forecasts underwent little revision as confidence went up (i.e., the boundary of the "confidence interval" narrowed). So, how would I rate the quality of the forecasts presented on this blog? Please take a look at this posting and feel free to offer comments. Tropical depression Twelve may give us some problems next week. There are areas of disturbed weather from Florida to South America that bear watching. We are only about halfway through hurricane season. 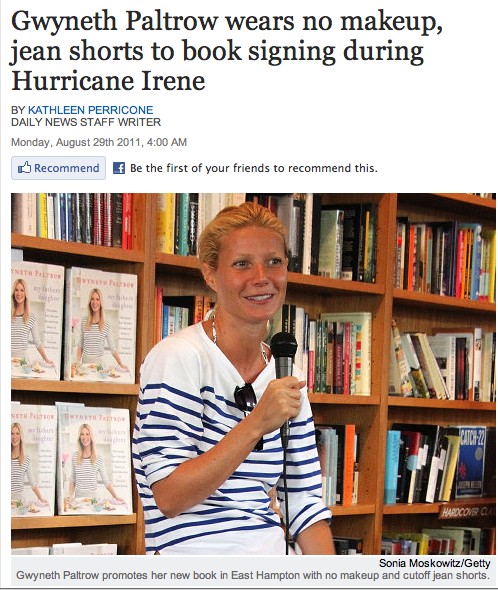 I suspect Irene will not be the only hurricane we will deal with this year. ADDITION: Here is another take on the accuracy of the forecast. 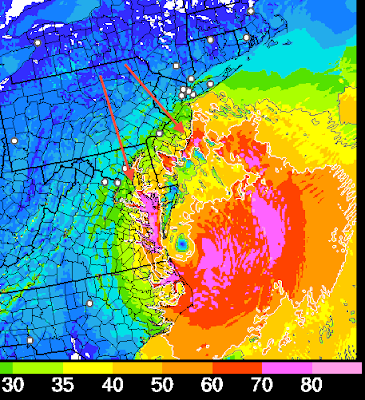 And, the New York Times has a good article about the weakening that took Irene from the 2 we forecast just southwest of NYC down to the borderline 1 it actually was. 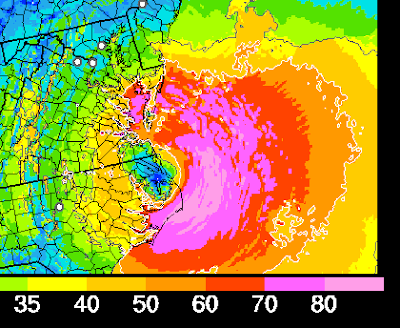 Interactive map of Irene's path and damage. Total "customers" (homes and businesses) that lost power are 5.8 million. The electric utility industry uses 3.5 people per "customer" so the total number of people without power is just over 20,000,000. UPDATE 6:50PM: My friend, meteorologist Dr. Cliff Mass, has a completely different take. 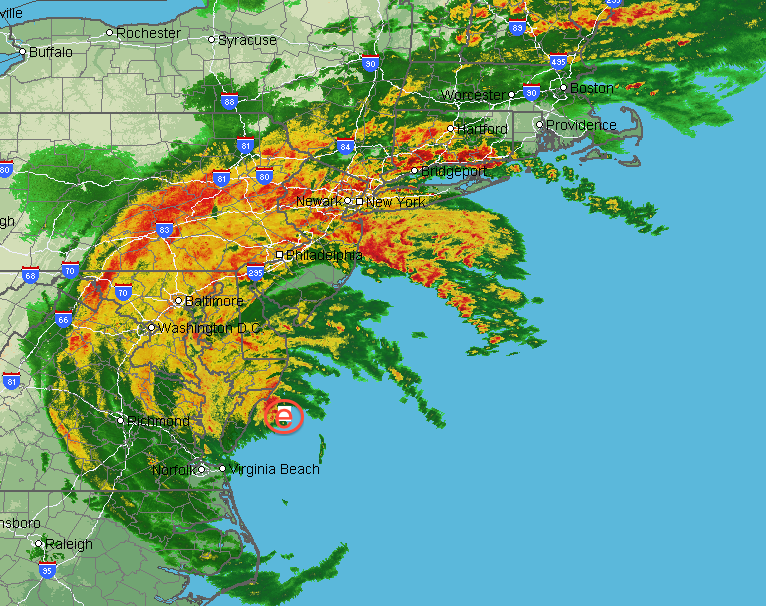 He does not believe Irene was even a hurricane north of the North Carolina border. As I understand NHC's reasoning (and I may be incorrect), there were very high winds aloft and over water and they were concerned those would sustain the hurricane. I present all of this because I want non-meteorologists to understand the complexities of what we are dealing with when it comes to hurricanes and tropical storms. 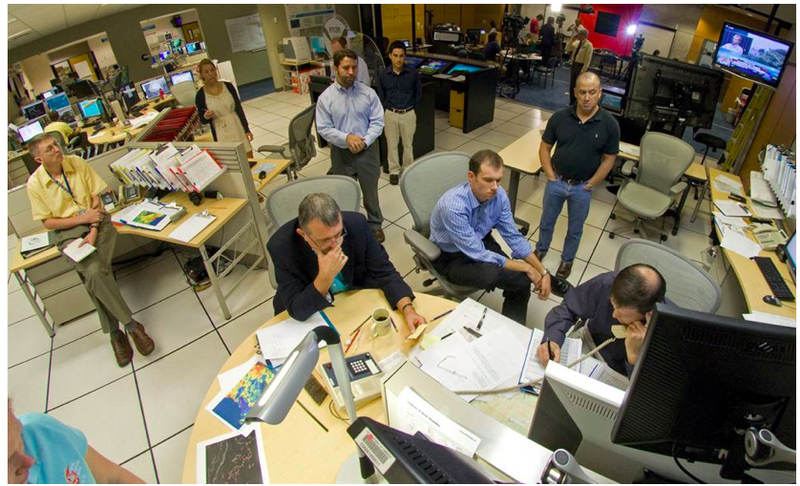 From Bill Read via Facebook comes this photo of the National Hurricane Center's staff Saturday tracking Irene. Associated Press photo by Andy Newman. I recognize the looks on their faces. It is a combination of concern and concentration and I see it on the faces of our meteorologists at AccuWeather all of the time. We are trying to outwit Mother Nature and human nature, the latter in the sense that we have to think through hazards that might not be obvious in order to give people the information they need to protect themselves, their families and their businesses. This map is created by using a combination of rain gauges and radar estimates to fill in the gaps between gauges. Combine these excessive rainfalls with what has already been a very wet August in the region and you have a recipe for extreme flooding. 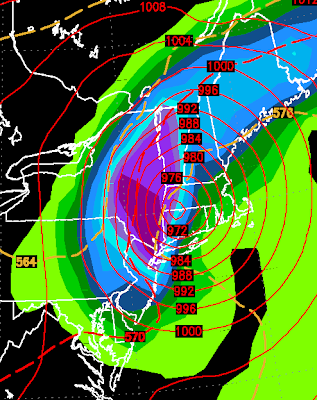 Tonight, I'll recap Irene with an eye to the accuracy, or lack thereof, of the forecasts. Mid-week, I'll be talking about the 30th, and last, anniversary of WeatherData, Inc., the company I founded August 31, 1981. WeatherData has had a distinguished history, plus the chances of a start-up business reaching the 30 year mark are far less than 1%. What made us successful? Please come back for all this and more. 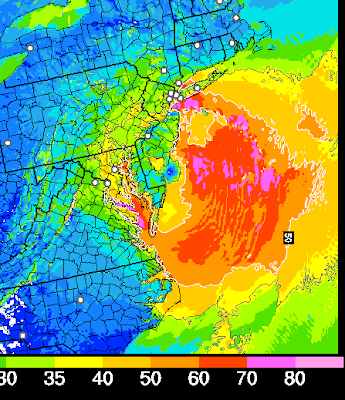 Should the National Weather Service Be Scaled Back? During my 40 years as a meteorologist, I have a lot of experience with hurricanes and other major storms. I have observed that hurricanes tend to bring odd ideas to the surface. When you combine an earthquake, the odd ideas – if my email is any indication – really start flowing. Beyond the theories about airplane vapor trails and remote control of earthquakes, perhaps the oddest idea floating around now is that that the U.S. National Weather Service should be shut down or deeply scaled back. Saturday evening, a friend forwarded a Fox News op-ed calling for the NWS to be abolished. That op-ed, if you wish to read it, is here. It is easy to say, “abolish the National Weather Service.” Explaining why that is a bad idea is a bit more complicated, so I hope you will bear with me. The National Weather Service of the United States (NWS) plays a vital role that would be impossible for the private sector to fill. That is due to the unique nature of weather. Because weather does not respect national borders and because the weather moves around the world, all nations must cooperate in order for effective forecasts to be made. Private companies cannot legally conduct foreign policy; that is a role of the federal government. The federal government must create the essential international meteorological infrastructure and data sharing agreements. So that objects in space do not collide, the federal government (NASA) manages the weather satellite program and coordinates with other nations’. It is unlikely that foreign governments would share their data with a U.S. private company and vice-versa. The U.S. relies on Meteosat (Europe and Africa), MTSAT (Asia and Australia), and GeoSat (East Asia and Pacific) to cover the world so we can forecast what is coming at us. I doubt any U.S. company would want to replace this infrastructure. The price tag would be well into the tens of billions of dollars. Current federal policy (set by the FCC) will not allow private sector companies to run 10cm weather radars. For technical reasons, 10cm are vital in measuring precipitation. We must have a federal entity for that. There has to be an entity to coordinate meteorological measurements so they can be used by all nations. That is the World Meteorological Organization, open only to governmental entities. Beyond policy, I have philosophical reasons for supporting the mission of the National Weather Service. Our federal government has a legitimate and important role in public safety (that is why we have a military and a Federal Bureau of Investigation) and creating infrastructure (interstate highways) that anyone can use. Given that philosophical position, it makes all the sense in the world to have the federal government create, maintain, and improve the meteorological infrastructure. Want to know the forecast, the current temperature, or the river stage? Just go the NWS web site and you can receive that information (paid for by your taxes) free. Or, if you prefer, you can go to AccuWeather’s web site or watch your local television meteorologist for a forecast. In most nations, the national meteorological service does not issue storm warnings, at least as we think of them. Our NWS provides warnings that saves lives. Since many businesses have need of meteorological services that differ from the general public, the private sector weather industry in the U.S. fills that role. In many nations, the national meteorological service provides special services for businesses for a substantial fee and there is little or no competition. England and France are good examples of this. The fees their businesses pay for special government services are far higher than U.S. businesses pay for similar services. So, some foreign companies contract with U.S. private sector weather companies for those services. That improves the U.S.’s balance of trade. Canada had the British/French model and has backed away from it in favor of a public-private sector partnership like the one enjoyed in the United States. Private sector weather companies like AccuWeather take the NWS data that is available to everyone and apply our technology and skills to it to create products that are uniquely tailored to the needs of our business clients. Businesses pay us for the value that we bring to their operations. Private sector weather companies, create jobs and pay taxes on our profits. Through this arrangement, the U.S. taxpayer is not paying for “corporate welfare” – i.e., special forecasts and services made by the government for individual businesses. But, we face a challenge in this period of likely tightening federal budgets. The amazingly accurate forecasts of Irene’s path were made possible because the NWS launched special weather balloons at an unprecedented rate last week and flew hurricane hunter and data gathering aircraft around the storm. Since we now know that making this investment directly results in a more accurate forecast, I believe Congress should make the money available to do this routinely in major weather situations and, perhaps, acquire additional data-gathering aircraft. Can some things in the NWS be cut and resources reallocated? Yes, but on balance, we need to invest more in the NWS and its data gathering and distribution. We need to make smart investments in research that, for example, will allow us to much more accuarately and consistently forecast the strengthening and weakening of hurricanes, a vital topic in view of our overforecast of Irene’s intensity. At present, weather science only has a moderate understanding of how hurricanes strengthen and weaken. By making targeted investments, we can fully leverage the rapid increase in forecast and warning accuracy to save lives and make the economy grow. The National Weather Service is one of the (unfortunately few) jewels of the federal government. It is one of the rare areas where there really is a “multiplier” effect: Dollars invested result in far greater numbers of dollars being created through lives saved and economic productivity increased. 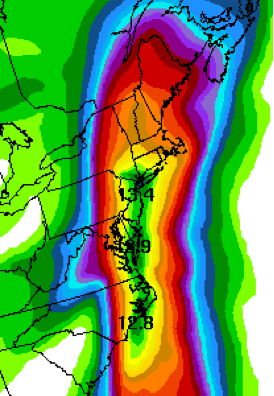 White = 20" or more, purple = 15" or more up to 8am EDT this morning. 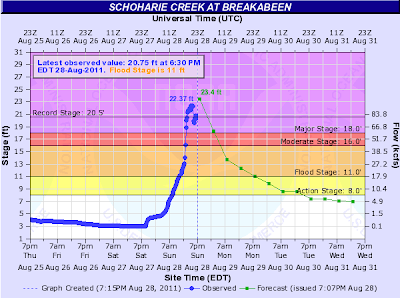 A record stage is near Gilboa Dam and the town of Prattsville that "unimaginable" flooding is occurring. A reporter with Fox News is reportedly trapped along with the people in the area. More of this is going to occur the next few days. 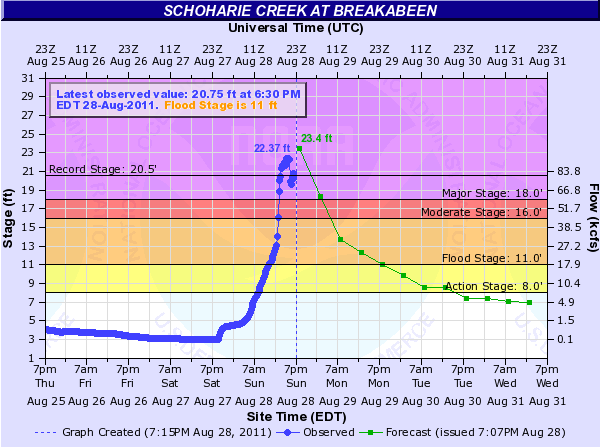 The river is expected to break the record crest by three feet! Flights are reportedly a mess. Here is my popular Airline Crisis Guide. ADDITION at 6:30pm CDT. Power failures are affecting roughly 15,000,000 people. Restoration efforts are just now getting underway in the Carolinas but more are losing power in New England with the remains of Irene. 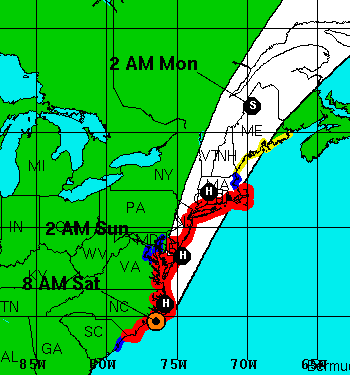 Irene made landfall at NYC and has been downgraded to a tropical storm. Now that she is over land she will weaken. However, the risk of downed trees causing more power failures (3.5 million people without power and rising) and excessive rainfall causing major flooding remains. The last tornado was allowed to expire. No tornado watches are out at present. 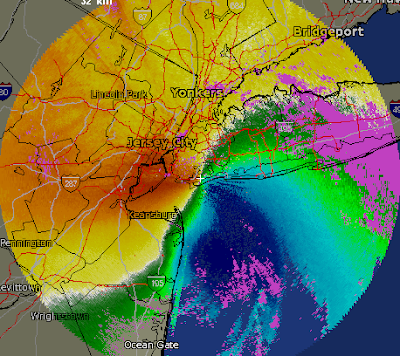 Here is the Terminal Doppler Weather Radar from NYC. The dark blue winds are hurricane force (75mph) just off shore at 7am. AccuWeather has a great graphic showing the future of the storm. The threats I have been talking about all week from NYC Metro east across Long Island and into coastal CT-RI and, to a lesser extent, MA are still present. If the center goes over NYC, it will be very interesting to see what the effect of the unusually large difference between Irene's surface winds and its atypical strong winds aloft on the high rise buildings. I am very concerned about major flooding. If you live in a 200-year flood plain in the area outlined above, be thinking about what you will need to evacuate and what you will want to take with you. Here is the position (e = eye) of the storm at 11:25pm Eastern. The experimental wind forecast system shows 70 knot (81mph) winds over New York Harbor at 4am EDT (give or take an hour) with a very small area of 80 knot winds (92 mph) just offshore. 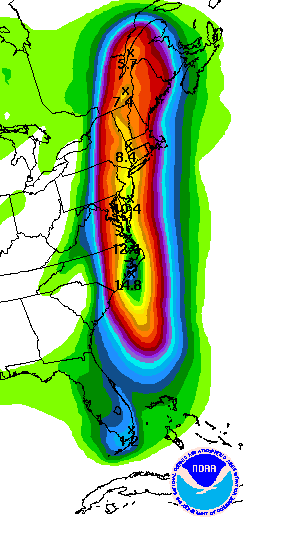 If this a perfect forecast, there will be coastal and tidal flooding in NYC. Wind gusts at the top of the high rises in lower and mid-town Manhattan will be around 110-120 mph in gusts. Finally, a tornado watch is in effect for NYC and points southwest until 5am EDT. The tornado threat for NYC will continue until mid-morning. Severe damaging tornadoes occurred in VA and DE today. If you are just finding Meteorological Musings, please feel free to look around while you are here. This will be the last update of the night. A friend forwarded this a few minutes ago, I had not seen it until now. Here are two books to read that will help you appreciate the "above and beyond" efforts meteorologists are making tonight to keep you safe if you are in the path of Irene. How dedicated are we? Well, I'm in KC for Kathleen's class reunion, yet I have been sharing ideas with our staff at AccuWeather Enterprise Solutions and I have been posting on this blog. Literally hundreds of other meteorologists are doing the same. There is an op-ed at Fox News tonight asking if the U.S. needs a National Weather Service. The answer is absolutely yes! I'll post a detailed reply to the article tomorrow evening or Monday when the hurricane situation has calmed. Stay tuned. Here is the Doppler radar measurement of wind speeds with the deep blue color = hurricane force. 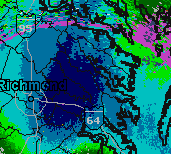 The peak wind the last hour at the Richmond Airport is 60 knots = 69 mph. So, it is very likely hurricane winds are occurring in the deep blue area. These winds and the hurricane are moving slightly east of north. The experimental wind forecast for 10pm EDT has gusts to 70 mph making it to the NJ coast and into Chesapeake Bay with several areas of 80+ mph gusts over water. Keep in mind the scale is in knots (1 knot = 1.15 mph). 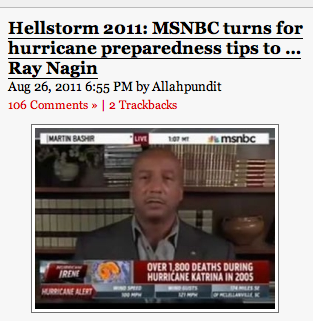 If you have any doubt about my headline, go read the three Katrina chapters in Warnings. They have upped their peak rainfall amount to 20". If amounts anywhere near this large occur, major flooding is likely. 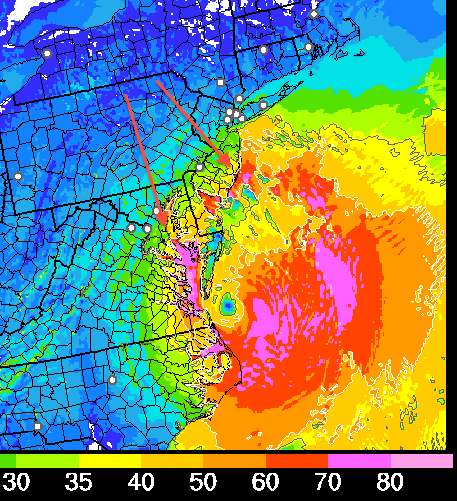 More so than with most storms…the winds with Irene increase sharply with height above the surface. As Irene moves through areas with high-rise structures…these structures will experience significantly stronger winds than indicated by the advisory intensity [which is a forecast of ground-level winds]. Winds at the 30-story level will likely be 20 percent higher than at the surface…and winds 80-100 stories up could be about 30% stronger than at the surface. The rest of the update below is still valid. Stay hunkered down if you are in the path of Irene. 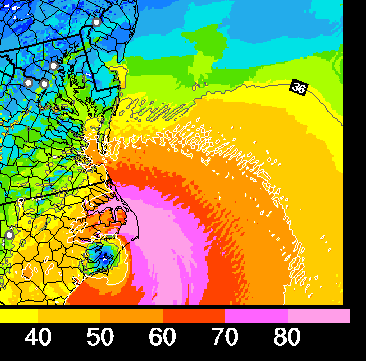 Here is a NOAA experimental wind field forecast for Irene at 11am Eastern this morning and again at 6pm this evening. Keep in mind the wind field forecasts are in knots, so 80 knots = 92 mph. Use this as a general guide for timing. There will be localized stronger winds and, of course, this does not forecast the location of tornadoes. Here is the AccuWeather radar image of Irene at 9:20am EDT. She is officially ashore. Hurricane warnings are now in effect all the way to Boston and Cape Cod. In the newly warned areas, preparation for sustained winds of 75 mph and gusts to 90-95 mph should be completed before dark tonight. Unfortunately, the power scenario is playing out as expected. According to AccuWeather, as of 6am, 189,000 homes and businesses in North Carolina, South Carolina, and Virginia are without power. 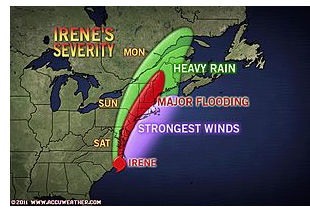 AccuWeather has more great info on Irene's effects at the link. The tornado watch has been extended northward. Two tornadoes -- with damage and injuries -- have already been reported. Mobile homes were damaged. A mobile home is no place to ride out Irene. Find more substantial shelter. Here is the current tornado watch. It will almost certainly be extended past the 11am expiration time. There is one peculiarity of the storm worth mentioning. While maximum sustained surface winds as of 9am were 90 mph (with higher gusts), sustained winds were 115 mph aloft. This does not matter in eastern North Carolina. It may matter quite a bit if the center of the storm goes over Manhattan in terms of damage to skyscrapers (i.e., objects like antennas blown off roofs and causing more damage as they fall) even if the storm weakens before arriving. 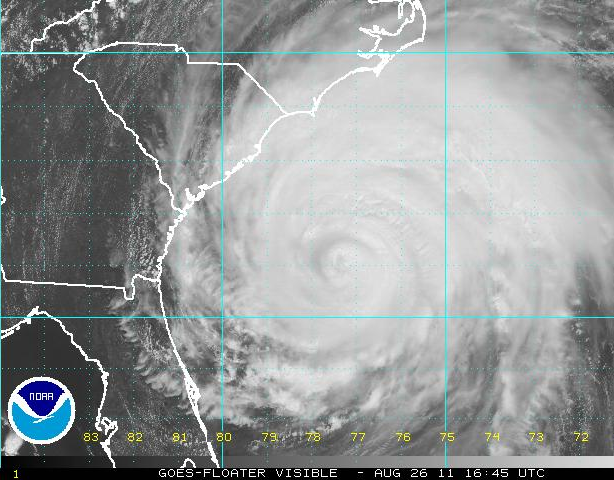 So, there are still many potential dangers with Irene. Until 5am EDT. Two tornadoes have already been reported. Statistically, tornadoes are most likely in the left front quadrant (relative to its direction of movement) of a hurricane. Tornadoes may still be a threat with Irene in southern New England and Long Island when the storm moves ashore in that region. LAST BLOG POST OF THE NIGHT. It has been a blowout day at the blog...record page views with more than double the previous record day. We went over the 250,000 unique visitors mark since Google started keeping that statistic in July, 2010. I didn't think we would hit that number until October at the earliest. Thanks so much to all that have found our blog. Please feel free to look around and comment while you are here. 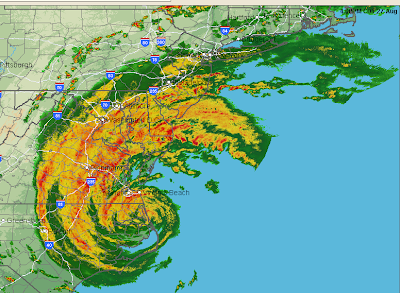 Here is the AccuWeather radar image of Irene at 9:40pm CDT. I have marked the position of the eye and its direction of movement. Sustained winds are now 100 mph. Since the storm will be well below the Cat. 4 intensity I talked about yesterday, there should be little wind-related structural damage. To be clear, I am saying your awning or carport may suffer heavy damage but your home or business should not sustain heavy wind damage if the windows are boarded up (if the glass breaks and a pressure differential occurs, all bets are off) and away from trees (there will be many toppled trees in NC and southeast Virginia). There will be structural damage to buildings that experience the storm surge. Irene has weakened a little more which means she should be a borderline hurricane when she reaches NYC-Long Island. Before anyone rejoices too much, there is a problem: She has slowed. This means the rainfall forecast has increased along with the threat of major river flooding. 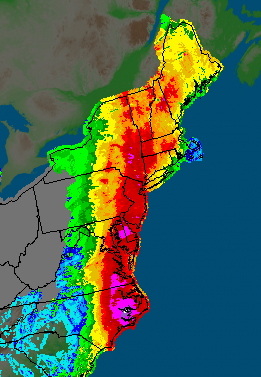 What are the hazards I have emphasized for New England - New York on this blog? All of those except, perhaps, the glass breakage are still in play. Since the wind speed will be less but the duration will be longer I don't know whether that nets out or not. For residences and low-rise businesses, windows should be boarded up or hurricane shutters closed. A longer duration of the wind means more piling up of downwind water so the storm surge forecast should be about the same. River flooding is a major threat. I like to break up the storm news with light notes and a little humor. Heard about this driving into work this morning and thought it was hilarious. Jim is one of my Twitter followers (thanks for the follow, Jim!) and you can be, too. Just follow @usweatherexpert. We are here for you at Mike Smith Enterprises, LLC and if you need to contact Mike or me please check out www.mikesmithenterprises.com and it will be our pleasure to promptly answer your request. During a hurricane emergency like this, it's all about saving lives and caring for others in need. Be safe and let us hear from you as you ride out the storm. My AccuWeather friend and colleague, Jesse Ferrell, has a detailed look, here. From Mindy and me, thank you to everyone who has come to the blog for what is already the all-time record day in terms of page views. I also want to thank other bloggers from Andrew Sullivan/Daily Beast to Glenn Reynolds/Instapundit to my colleagues at AccuWeather who have linked to the blog. Because, if the stats are right, we have more than 3,000 entirely new readers today, let me get you caught up. The blog is sponsored by Mike Smith Enterprises, LLC. In addition to my "day job" as Senior Vice President at AccuWeather Enterprise Solutions, I do professional speaking on disaster mitigation, global warming, and science as it applies to business. My entire career is devoted to saving lives and property when extreme weather threatens. There is a list of dates of presentations at the top of the MSE home page. MSE has a brand new Facebook page, click here. I am the author of Warnings: The True Story of How Science Tamed the Weather. There are reviews at the link. Warnings has its own Facebook page. While you are here, please look around. Thank you for visiting!! 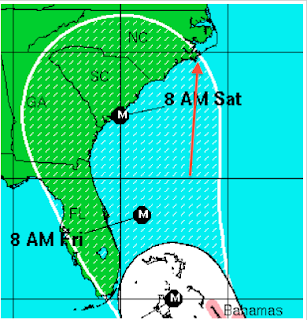 It now looks unlikely that Irene will reattain Category 3 status and will remain an upper Category 2. 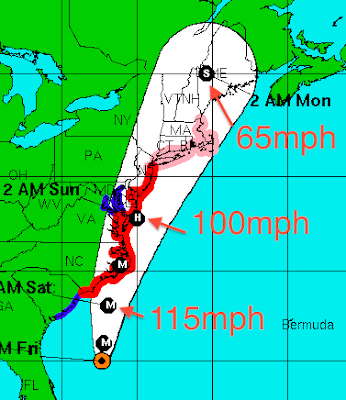 The path forecast (below) is largely unchanged but you can knock about 5-10 mph off the wind speeds. That is more significant than you might think because wind force is geometric, not linear. Don't relax, however, The storm is quite large and still capable of many problems. 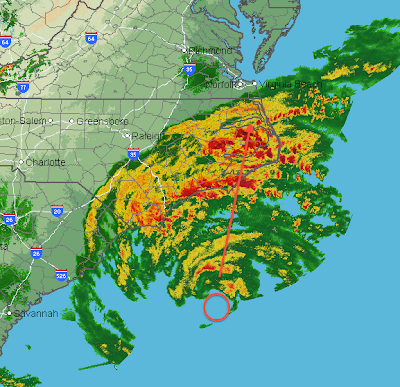 The outer rain bands and squalls have already made it to the coasts of eastern South Carolina and North Carolina with power failures already reported. It is all downhill from here. So, check the path information below and you have the latest. 2,600 homes and businesses without power in South Carolina. Let's begin with her photo. She is being a bit coquettish as she keeps batting her eye at us. Right now, the eye is closed. A more intense hurricane would have an open eye. Irene weakened a bit during the night and is now a strong category 2. 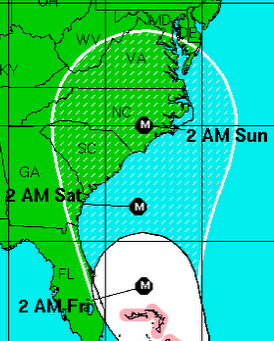 However, she may strengthen back to a 3 before landfall in North Carolina. The track forecast is little changed. 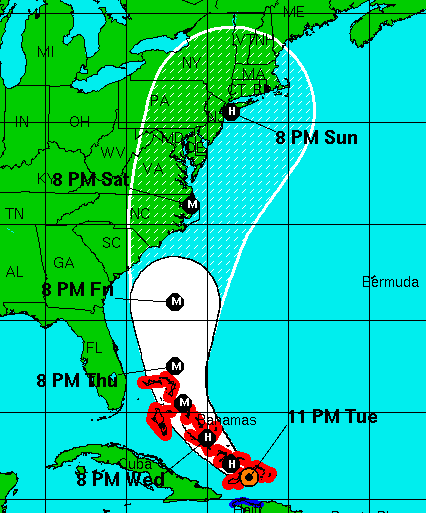 Hurricane warnings are out from North Carolina's coast to New York City. The hurricane watch has been extended to the New Hampshire-Maine border. Note that the National Hurricane Center is forecasting the storm to reintensify to a Category 3 ("M" = major) and, while over eastern North Carolina, sustained wind speeds are expected to reach 120 mph. 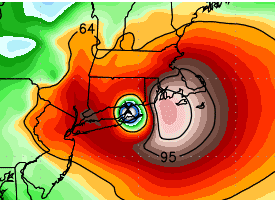 The single most accurate model, the ECMWF (a/k/a "the European"), is still showing the storm moving very close to NYC, perhaps a tad west of the hurricane center. Preparations should be completed as soon as possible. there WILL be flooding, both river and coastal, and there will be geographically widespread power failures. This morning's song is the great Frankie Valli singing the original version of the Bob Gaudio song, "The Sun Ain't Gonna Shine Any More." For those who do not prepare, it may seem like the sun won't shine again. Don't be one of them! There are plenty of preparedness tips below on the blog, just page down. And, the "Today" show's Kerry Sanders had a wonderful illustrated set of preparatory tips. I'm sure they will post it on their web site later this morning.